ORLANDO, FLORIDA (JANUARY 2, 2014) — Maceration. Chances are, you’ve come across this “new” plumbing technology with the strange-sounding name at one time or another in recent years. An innovative alternative to conventional, below-floor drainage — developed in Europe almost 60 years ago — maceration first came to the U.S. market by way of Canada in the late 1990s. If you are a plumbing wholesaler or contractor based in the Northeast or the Middle Atlantic, macerating systems should be a familiar solution to a variety of plumbing-drainage problems. But if you work in the South or West, you may associate the technology primarily with basement applications. In fact, you may well think that, when it comes to maceration, basements are the only application: And, because there are few homes with basements in your region, you’ve seldom, if ever, seriously considered maceration a viable option. If so, what a shame. 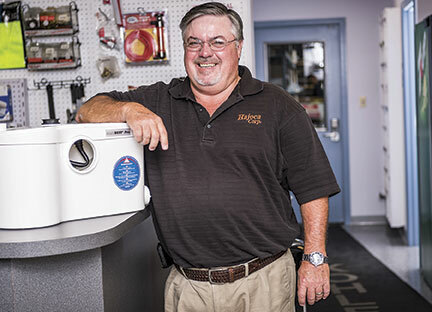 That’s certainly how 36-year plumbing-industry veteran Jim Holtzapple, manager of Hajoca’s Orlando branch since 1996, regarded macerating plumbing technology until recently. 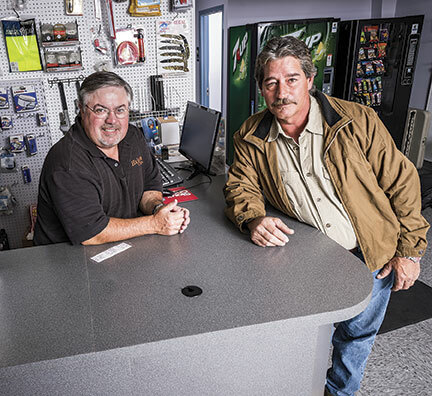 But then a timely sales visit by Regis Saragosti, CEO of SFA Saniflo, and his local sales agent, Tom McGuire of Florida Sales & Marketing, saved Hajoca a nifty $1,700 on a branch-expansion project. Today, Holtzapple is not only a true believer, but also a true believer with inventory, as he and his sales staff actively promote the Saniflo line of macerators, grinders and drainage pumps to the trade. Holtzapple’s — and Hajoca Orlando’s — conversion to maceration came relatively quickly last summer. The 30,000-square-foot (sf) branch was in the midst of a 2,000 sf expansion, including an enlargement of the counter area, with a new customer restroom nearby. 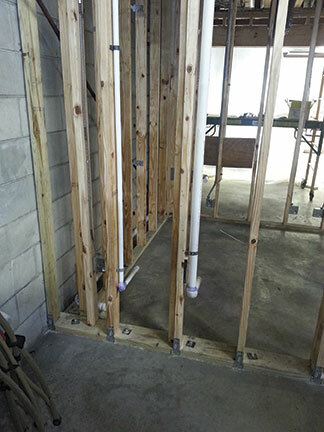 Installation was done by Hajoca customer John Mulvaney of Mulvaney Plumbing Systems of nearby Apopka, Fla. He requoted the job with a Sanibest Pro system, which resulted in the $1,700 savings, including labor. Holtzapple estimates that it might have taken Mulvaney 10 to 15 days to get his facility back to normal in the wake of the headaches and hassles of tearing up the floors. 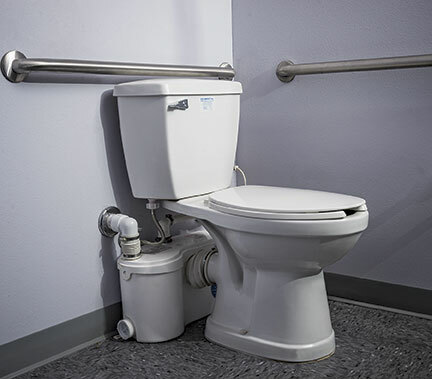 But with the Sanibest Pro, which handles drainage for both a toilet and a sink, Mulvaney had the new restroom “up and running in a day,” reports Holtzapple. The renovation was 100-percent finished in mid-September. 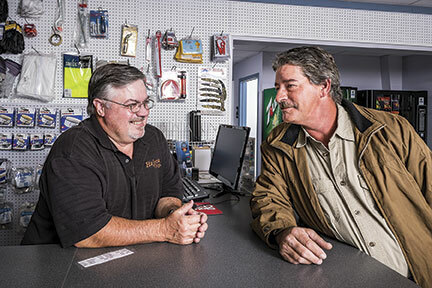 As other wholesalers who have installed macerating systems in their customer restrooms have happily learned, these facilities make excellent, impromptu “showrooms” for the technology. Rather than hiding the macerator —along with its supply, discharge and vent pipelines — within the wall, Holtzapple had Mulvaney position the lines in full view of anyone using the facility. Seeing and hearing the exposed device in operation inevitably triggers questions from curious plumbers. In the aftermath of the renovation, Hajoca Orlando began stocking Saniflo product in earnest. 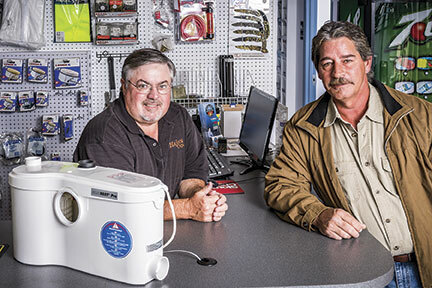 At first, Holtzapple confined his inventory to macerators, but he soon expanded the offering to include grinders for commercial and whole-house applications, as well as drainage pumps for kitchen and laundry room projects, as well as condensate pumps for HVAC applications. High-rise buildings, including office towers and multi-family dwellings: These projects typically involve tenant-finishing jobs that require additional plumbing lines; e.g., a coffee area, a wet bar, a laundry room, etc. If the property is residential, below-floor drainage lines are likely prohibited. But whether residential or commercial, if the structure is made of pre-stressed concrete with tension cables in the slab, core-drilling can be an expensive risk: Hit one of those cables, and the building’s structure integrity can be seriously compromised. Commercial gray water applications: Florida enjoys a very active gray water drainage market, McGuire notes. These include not only residential projects (laundry tubs, half baths, summer kitchens), but also numerous commercial jobs. These applications usually call for drainage pumps that do not include a macerating or grinding function, because there is no solid waste. 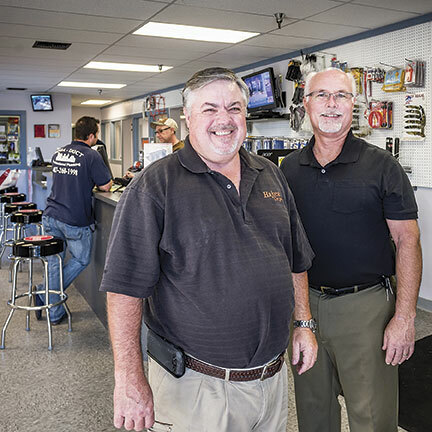 Hajoca Orlando’s two-person, outside sales team of Chris Corbin and Bob Foget share a combined 60 years in the plumbing industry. In getting up to speed with maceration, its uses and operation, they quickly grasped its potential and versatility. Not surprisingly, their biggest challenge has been overcoming their market’s basement-only bias. “That’s just the way people think right now,” says Holtzapple, “but we’re working hard to change all that. 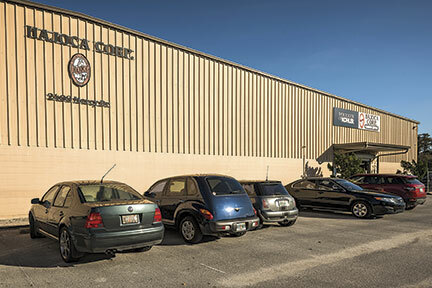 Exterior of Hajoca’s 30,000-square-foot branch in Orlando, Fla.
Hajoca Orlando manager Jim Holtzapple was familiar with maceration technology, but “I had just never thought about it for this particular application” until a timely visit by Regis Saragosti, CEO of SFA Saniflo, and his local sales agent, Tom McGuire of Florida Sales & Marketing. 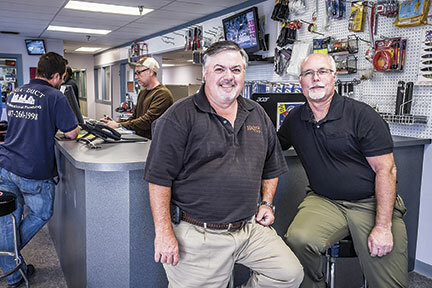 Hajoca Orlando manager Jim Holtzapple (left) with customer John Mulvaney of Mulvaney Plumbing Systems in Apopka, Fla. Mulvaney did the installation of the Sanibest Pro macerating system at the Orlando branch. 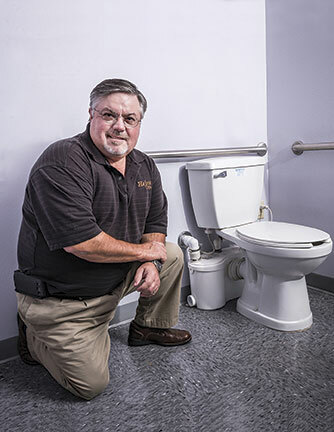 Hajoca Orlando manager Jim Holtzapple inside his new customer restroom with the Sanibest Pro system from Saniflo. Use of the above-floor plumbing technology “eliminated the need to break through our concrete floors and all the problems and costs that entails,” explains Holtzapple, who estimates he saved $1,700 on the installation. The Sanibest Pro system from Saniflo, as seen inside the new customer restroom at Hajoca Orlando. 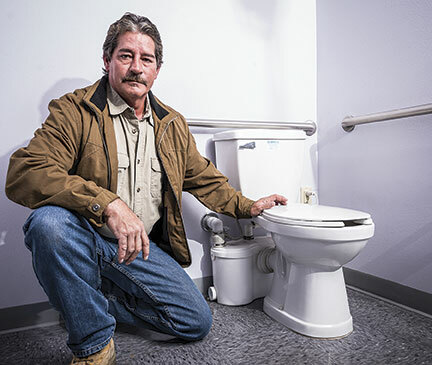 Manager Jim Holtzapple had plumber John Mulvaney position the pipelines and macerator (behind the toilet on the left) in full view of restroom-users. 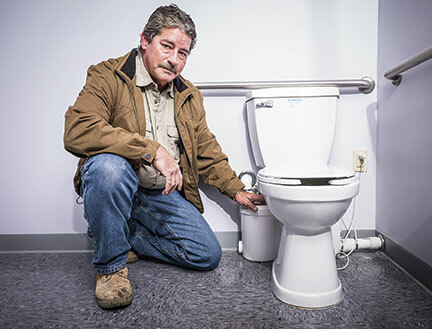 Seeing the exposed device in operation inevitably triggers questions from curious plumbers. John Mulvaney of Mulvaney Plumbing Systems with the Sanibest Pro macerating system he installed at Hajoca Orlando. Manager Jim Holtzapple estimates that Mulvaney might have needed 10 to 15 days to get the Hajoca Orlando facility back to normal in the wake of tearing up the floors. But with the Sanibest Pro, Mulvaney had the new restroom “up and running in a day,” says Holtzapple. 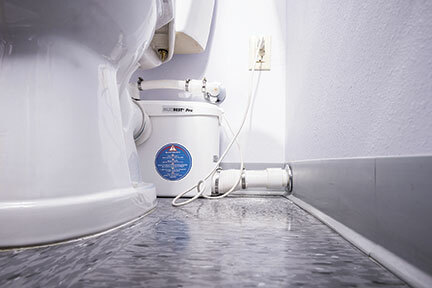 Floor level view of the Sanibest Pro macerating system with the macerator in the background behind the toilet. Shown here is the new customer restroom at Hajoca Orlando while under construction during the summer of 2013. Piping is for the above-floor Sanibest Pro macerating system, not yet installed.